What Battaile says about prohibition and transgression is fascinating, ‘the fulness and reality of the game man plays are his consequences overstepping what is prohibited’, he refers of course to a conscious transgression, this knowingness is part of ‘the desire, the need for a more profound, a richer, a marvelous world, the need, in a word for a sacred world.’ This he calls Authentic Transgression, which occurs in contrast to accident or indifference to the rules. 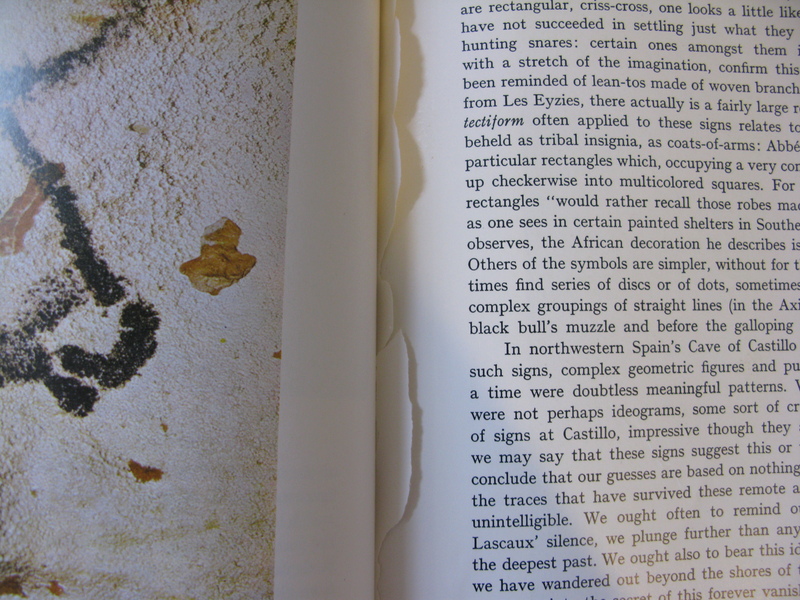 This is illustrated most clearly, I discovered at page 49-50, which has been torn out of the book. This act of vandalism to a rare and valuable book disrupts my reading and induces irritation rather than a sense of the marvelous or mysterious. There are two other missing pages, their jagged remains jut out from the binding, I can only guess that were taken for their colour images. 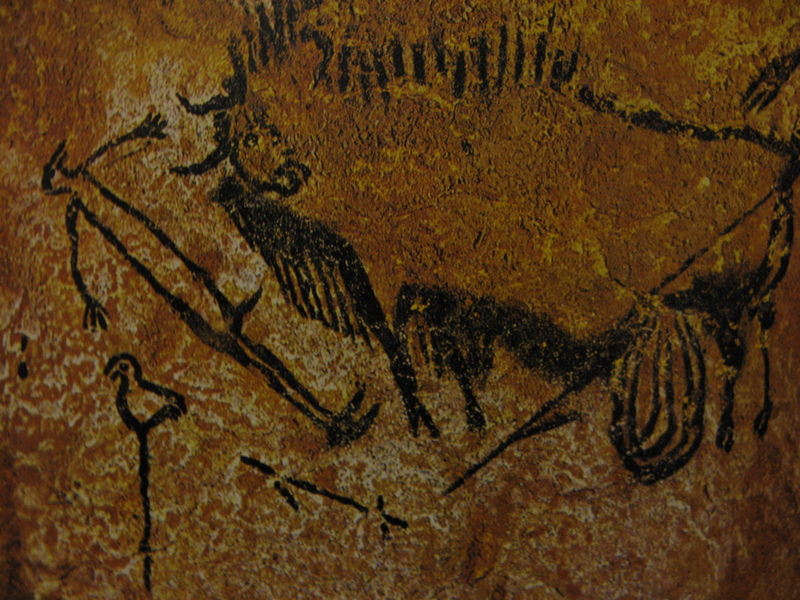 I deduce that an image or images of the Main Hall of the caves proceeds the diagram above, and that they must have been stunning. 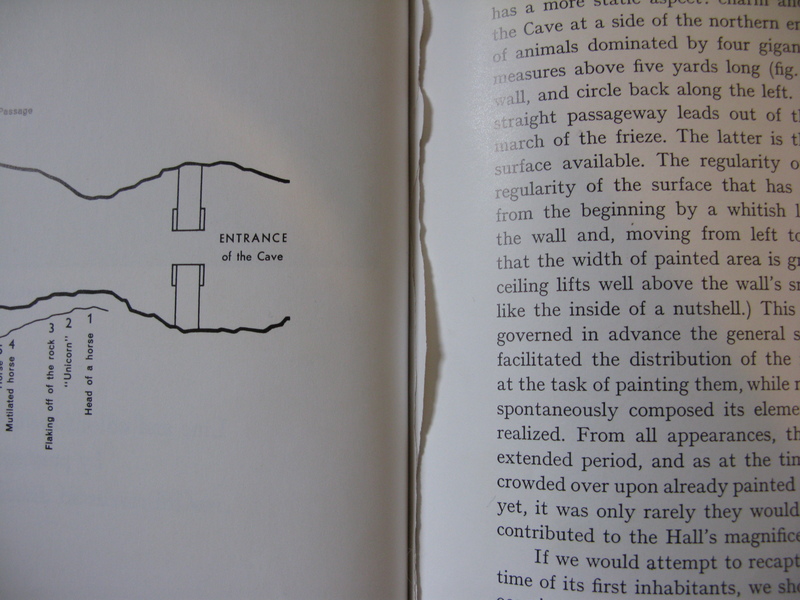 Bataille describes the hall as 30 x 100 ft, and ‘the most important part of the cave’, and therefore the most important part of the book. Now I realise they have gone I really want to see them. My annoyance has turned to curiosity, where did they go? Would it be possible to locate them, perhaps using library records to track down every person who had borrowed the book and send a letter asking, ‘did you steal pages 49-50, 51-52 and 89-90? It seemed arduous and pointless. The idea of replacing the missing pages myself seems a much more interesting idea. It’s funny the urge one has to fill the void, replace what is missing with something else. However it seems strangely appropriate that through this gesture the problems of prohibition and transgression could be explored. Prohibition: Don’t damage books. Transgression: Ripping pages out. In this case, an unsatisfactory transgression. It serves no purpose, except perhaps that my outrage has made the book a sacred object. I hold back the urge to get hold of another copy of the book or google search the images. I want to hold on to the sensation that belongs to them not being there. Perhaps another prohibition is: Don’t change the content of books. But I find that this is something that can be transgressed or played with more easily. The authoritive voice of the author, who’d been to Lascaux and researched the work of others could be replaced by my own guessed facts, deduced from the other pages, the voice of someone scrambling in the dark. This would be something i would enjoy, it reflects the reality of the caves themselves. We can only make educated guesses at what the paintings were for or what they may have meant to the people who made them. Bataille himself makes wonderful use of this guess-work, he explores the instincts of modern day people and draws logical conclusions from this. For me this act of creativity, or even just the thought of restoring the pages might be redemptive, it would make the initial transgression worthwhile. 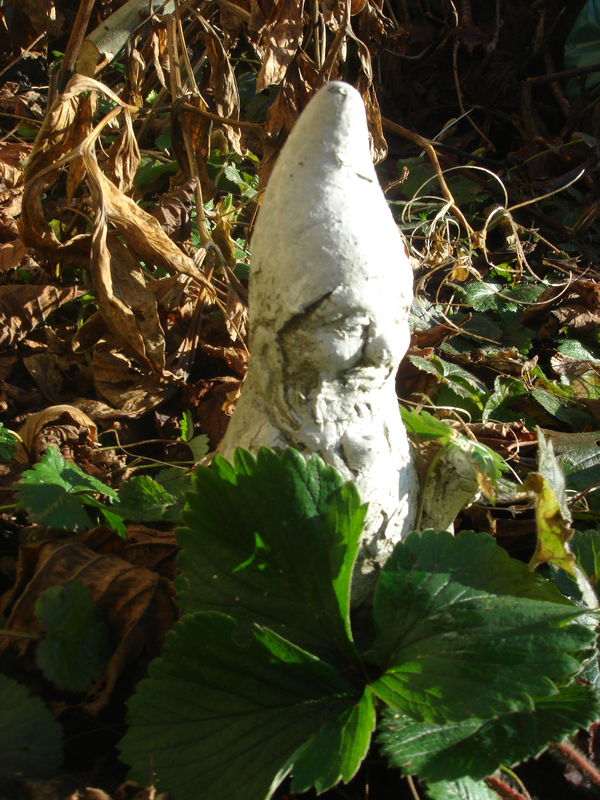 This is Norman, he is a little white ceramic gnome who watches over the strawberries in my garden. He isn’t real but the squirrels think he is, thats how it works. I’m not too sure how he fits with the subject of this post, other than the fact that he depicts a magical being. 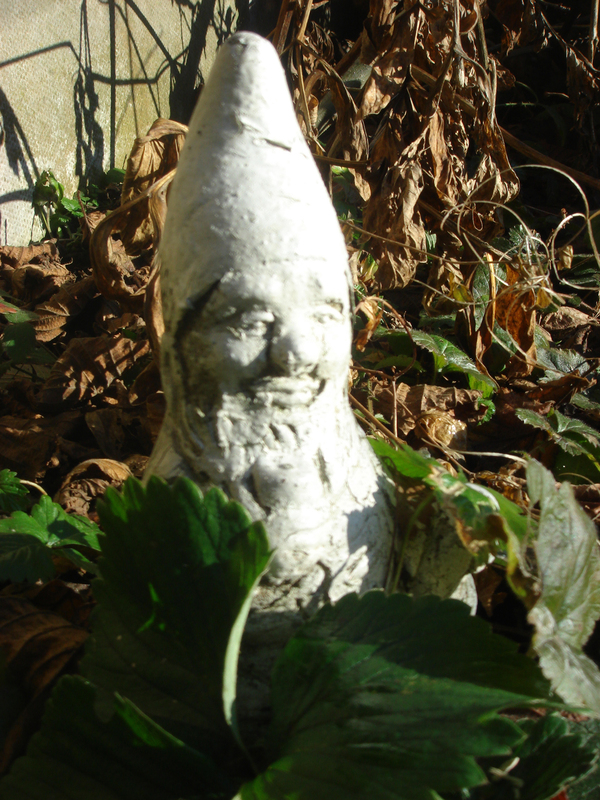 He looked so nice out in the sunshine that I had to take his picture and show it to you. 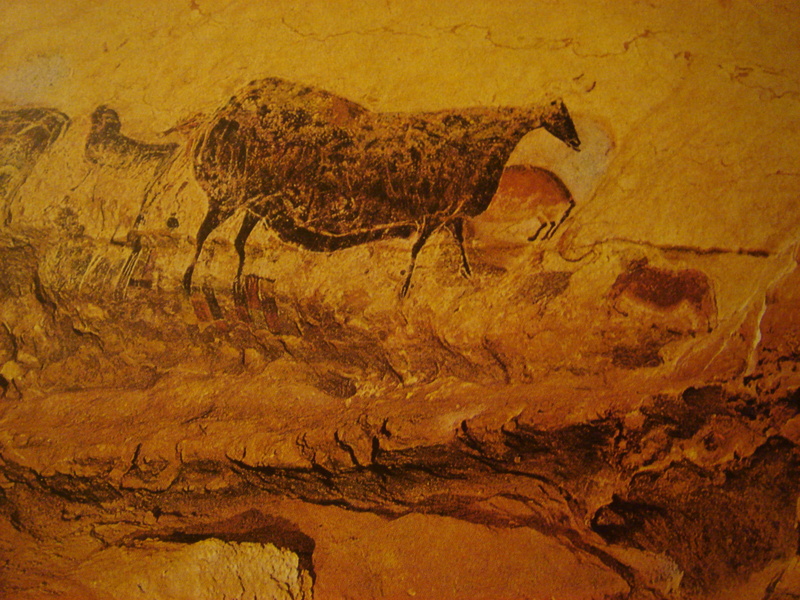 Back to Bataille in the caves of Lascaux. 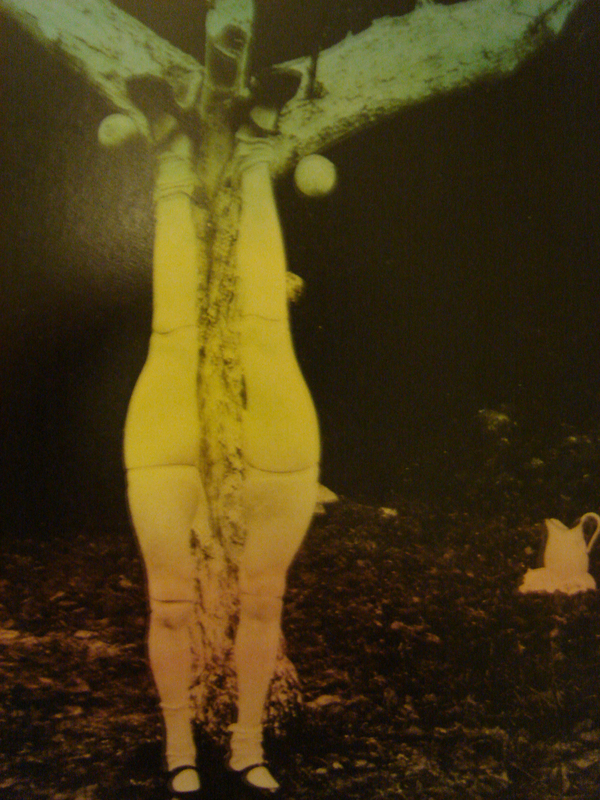 He says that those paintings were not necessarily magic, they didn’t all serve a function, i.e. to help the hunter etc.. he offers the suggestion that the people who painted those images were playing. 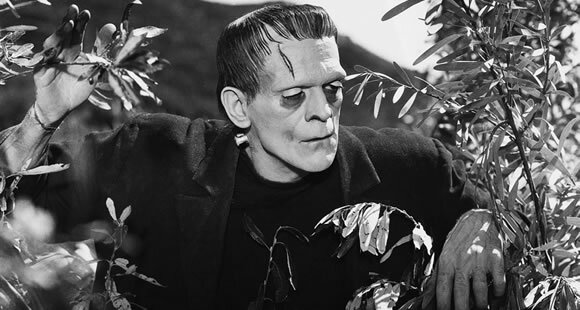 It is play that distinguishes our kind of human from the Neanderthal, who just made tools and worked. 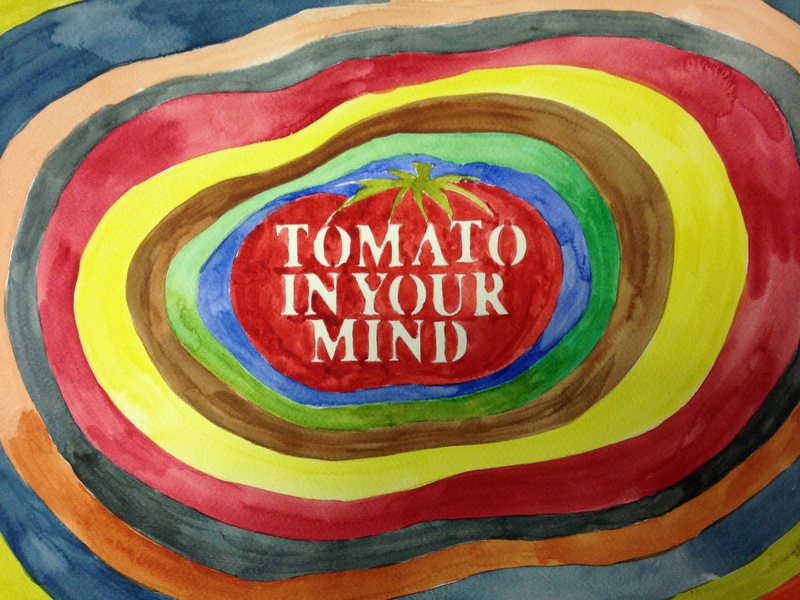 Art making was the first playful act. 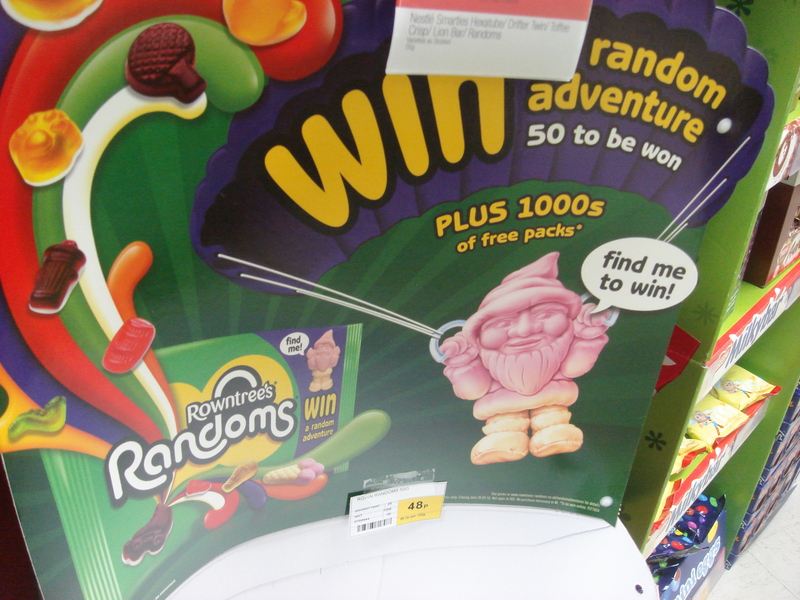 In this light it makes sense that the advert, I’m going back to the ‘Rowntrees’ Randoms’, is a kind of magical act/image. It most certainly serves a purpose and it does this through enchantment.